Our last post we discussed the concept of “Virtual Wine Tasting.” Which is where you taste and discuss wine along with others online. Well, our friends over at Minstrel and Muse Audio Art Magazine are hosting monthly virtual wine tastings. 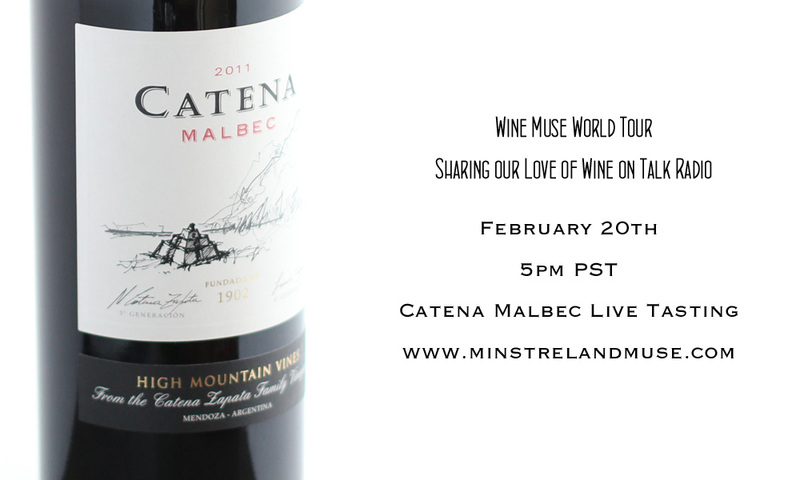 They are calling their online wine tasting show, Wine Muse World Tour. You are invited to join them on the third Thursday of each month and taste along with them live. An actual virtual wine tasting and you are invited. If you miss this wine tasting, they will have a link to a recording of the show so you can taste later. You won’t be tasting “live” with them, but you can share in the appreciation and discussion of the same wine. Following are some show details. Enjoy. * If you miss the live show, you can always listen to the recorded show/podcast. In partnership with Minstrel and Muse Audio Art Magazine – live virtual wine tastings will be held on the Third Thursday of each month at 5 PM PST. These wine tastings are hosted by Linda Rez of Minstrel and Muse Audio Art Magazine and co-hosted by William Pollard of Wild 4 Washington Wine. Taste along and see if you too can identify the same aromas and flavors. It’s a fun learning experience of sight, smell and flavor. Throughout the year they will be visiting some of the many wine regions of the world. You can share in the adventure of tasting a World of Wine and learning about each wine and the country it is from. Twitter users can follow along using #WineMuse for tasting tweets.